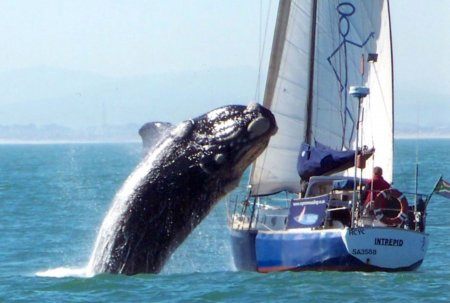 The viral pictures of the whale breaching onto a yacht took me back to a pivotal moment in a long-distance sailing race years ago. In yacht racing, we plan our race and race our plan … usually. Sometimes, however, fine plans must be cast aside under the pressure of crushing reality. The viral pictures of the whale breaching onto a yacht took me back to a pivotal moment in a long-distance sailing race years ago. As our team worked the zephyrs about 270 miles off the Washington coast, we spied a pod of gray whales not far off to port. The morning sun glistened off their backs as they ambled north. We’d just finished breakfast, so our entire crew was on deck appreciating the scene when one whale turned abruptly, accelerated, and put our broadside in his cross-hairs. Like a surface torpedo, he sped toward us. In horrified silence, we braced ourselves. In yacht racing, we plan our race and race our plan … usually. Sometimes, however, fine plans must be cast aside under the pressure of crushing reality. The same applies to product development. No matter how well we prepare, there will always be unforeseen challenges. This is precisely why companies must be both nimble and resilient. Being nimble enables us to alter course quickly before we stumble. Resilience allows us to recover quickly after we stumble. Consider, for example, the nimbly resilient response of a prominent European consumer products company. They enjoyed a market-leading position in the shaver industry, but were frustrated at their inability to crack the youth market. An extensive research effort revealed that the company’s superior shaving technology was just that–superior. And that’s what made the shavers less desirable to this group. Young men are quite proud of their manly whiskers. The last thing they want is a clean shave. They want to feature their stubble. With this insight, the company quickly developed and launched a highly-successful youth shaver that focused less on delivering a super clean shave and more on leaving behind well-groomed proof that these were indeed, manly men. As conditions evolve, the successful adjust. In competitive sailing, we call this “shifting gears.” An eye to the sky often portends changing conditions. The clouds give precious clues about the future. With this new information, we can tack or jibe to position ourselves for a favorable wind shift. Being nimble on the race course leads to victory. So it goes in business. Pay attention to changing conditions and shift gears quickly in response. Be nimble. And, when an unexpected gust shreds your sails, clear the wreckage and spread new canvas. Be resilient. So what happened with Mr. (or Ms.) Torpedo Whale? Moments before impact, the brute exhaled and dove to narrowly clear our keel. He resurfaced on our starboard side, leaving the boat shaking in its turbulent wake. What was up with that? Why would he exhale immediately before diving? Most mammals would inhale. Perhaps he was just a rambunctious teenager messin’ with us. Perhaps it was the proverbial “warning shot across our bow.” I wish I could say we scraped up the slimy whale sputum left behind and applied it to our bow to enable us slip through the water more quickly and sail to victory. But that would be a whale tale of a different kind. Instead, we fought to overcome the gagging stench and scrambled to rid the boat (and ourselves) of the thick, gooey coating. We came in second in the race. But we did win the award for Best Story.